As promised, here is the second Valentines gift that is easy, cheap, and oh so cute. Measure your pillow. (Mine is 12" x 16") Determine amount of fabric to cut by multiplying the length of the long side (16") by 2 (for front and back), and adding 4" for seam allowance and overlap. I cut my fabric 12" x 36". Because I used burlap, it didn't matter which way I laid the fabric, but if you are using a printed fabric, lay the fabric right side down with a short side towards you. For my pillow this was the 12" side. Measure and pin a 1/4 ". Iron flat. On the other short side, measure 1/2", pin, and iron. (This is the side that will show on the back of the pillow.) Sew both hems. If you are using printed fabric, lay it with the right side up with the long side towards you. Fold the side with the 1/2" hem over a little more than half-way. Fold the other side over so it overlaps the first side. Make sure your fabric measures from fold to fold the same as your pillow. For my pillow, I folded each side over 9 1/2" and the fabric from fold to fold measured 16". Pin each side seam, and sew with a 1/2" seam allowance. Trim the seam allowance at each corner. Turn each side right side out, and push the corners out. Stuff in your pillow, and your just made your pillowcase! Now onto the personalization. I printed out my quote in a similar font and size as the letters on my stencil to better visualize the layout of my quote. Then I tied yarn around my pillow as a guide...no one likes droopy words! Use a sharpie and your stencil and color away! This is great! Very cute. I would love it if you come by and link this up at From Scratch Friday tomorrow @ Marriage from Scratch! You're welcoming. So glad you linked up! Hi Saleena! Stopping by from Simply link party. I love how it turned out your pillowcase! And I have some burlap at home so I'm definitely trying this! I just have to buy the stencil and I can start! 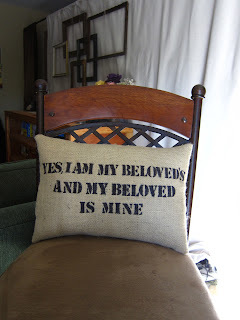 Burlap is so in right now and your pillow is great!